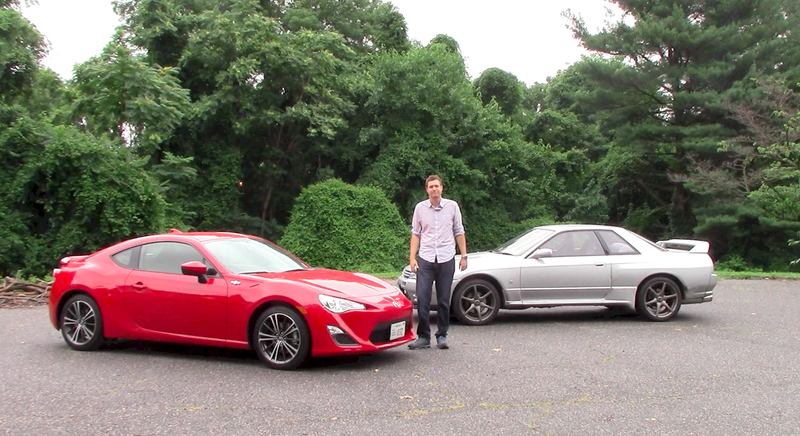 1990 Nissan Skyline GT-R vs. 2015 Scion FR-S: Which Is Better? I recently had the chance to compare my Nissan Skyline GT-R to a Scion FR-S. Yes, folks, that’s right: I’ve compared my legendary, powerful, fabled, privately imported, mad tyte JDM yo Nissan Skyline GT-R to a budget-priced Toyota with more interior plastic than a McDonald’s Play Place. You’d know all about my time with the Scion FR-S if you followed me on Twitter, because that’s where I posted this rather controversial photo of its automatic transmission lever a few days ago. This elicited several interesting responses, from angry (“I HATE THIS”) to mean (“That’s disturbing”), and I kind of got the feeling that if the FR-S were a public figure, it would have to do a weepy 60 Minutes interview in order to apologize for its gearshift. Fortunately, I’ve spent a lot of time in both automatic and manual versions of the FR-S, which means this great comparison test was unaffected. So today, I’m bringing it to you in two fun flavors: there’s my regular column, which is filled with several hilarious remarks and a dramatic overuse of italics. And then there’s a YouTube video, which I filmed with my friend Jordan in a public park. If you’re really bored, you can experience both flavors in order to really maximize your daily dose of Doug DeMuro. But if you really think about it, you’ll quickly discover that these two vehicles have a lot more similarities than you might initially realize. They’re both sporty Japanese cars. They’re both coupes. They’re both about the same size. They both come with front seats that are perfect for an adult, and rear seats that are perfect for a USB stick. And more importantly, they both cost about the same. Yes, Scion FR-S owners, you read that correctly: for what you paid for your sporty little Toyota, you could’ve lived out your Gran Turismo fantasies with a real-life Nissan Skyline GT-R. So did you make the right decision? On the surface, the answer seems like a resounding “NO.” For one thing, the Skyline is way cooler than the FR-S. When I pull up to cars and coffee in my Skyline, an entire generation of video game playing youth is transfixed, excited, unable to avert their gaze, until finally I’ve parked and they mob me with questions like “How fast is it?” and “Is it legal?” and “Aren’t you the guy who crashed that Camaro?” Meanwhile, you pull up to cars and coffee in an FR-S, and the attendant tells you that spectator parking is in the back. The Skyline also boasts much better numbers than the FR-S. For instance: Nissan Skyline GT-R, 276 horsepower. Scion FR-S, 200 horsepower. Nissan Skyline GT-R, 266 lb-ft of torque. Scion FR-S, 151 lb-ft of torque. Nissan Skyline GT-R, four rear tail light circles. Scion FR-S, two rear tail light circles. These are the figures that matter to the automobile enthusiast. It’s not just numbers where the Skyline pulls ahead of the FR-S: it’s the whole experience. The moment you walk up to your Skyline, you’re excited. Fascinated. Happy. The Nissan Skyline, you think. And you recall your Gran Turismo days, when you’d crash a 26-pixel Skyline GT-R directly into a 19-pixel wall at 140 kilometers per hour and you’d still win the race. Then you climb in on the wrong side of the car, and you slide your left hand on to the gear lever, and you cruise down the street. People scream “Nice Skyline!” or “Is that a GT-R? !” It’s just such a sense of occasion. These things don’t happen in an FR-S. What happens in an FR-S is, you get stoplight drag race offers from people in Dodge Neons with stick-on fender portholes. And surprisingly, the Nissan doesn’t lag very far behind the Scion in terms of equipment. When you hear that two cars are 25 years apart in age, you generally think that one is all modern, and nice, and new, while the other one has seat belts that wouldn’t save you in a crash with a surge protector. But that’s not true here. Both cars have anti-lock brakes. Both cars have power locks, power mirrors, and power windows. Sure, the Scion has keyless entry, and a touchscreen, and a few extra safety features. But the Skyline has automatic climate control and – this is highly important – a mini-disc player. This allows you to listen to all of your favorite J-Pop artists, including Mr. Children, Sunset Swish, Aqua Timez, and my personal favorite, Flumpool. These are actual names of J-Pop artists. Skyline GT-R Owner: Hello, can you work on a Nissan Skyline GT-R? Shop Owner: Sure, how much do you want it stanced? There’s also the issue of right-hand drive. Oh, sure, it’s fun and unique and kind of cool for a little bit. But after a while, it gets a little tiresome. What I mean by this is, it gets a lot tiresome. What I mean by this is, sometimes you’re cruising around with no concept of where your car is positioned relative to vehicles on your left, and you realize maybe you’d rather be driving a giant yellow Hummer. So here’s my conclusion: if you’re looking for a fun, exciting, sporty car you can drive every single day without issue, get the Scion. If you’re a crazy Jalopnik columnist who buys weird cars just to write columns and make videos, get the Skyline GT-R. You should also get a normal-sized lapel microphone.